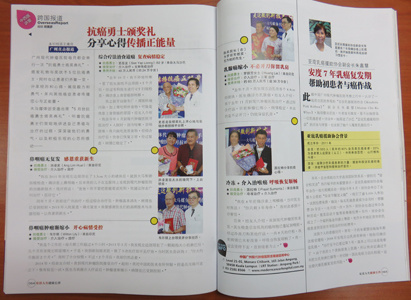 In August 2015, Long Life Magazine published an article about the stories of anticancer worriers of Modern Cancer Hospital Guangzhou. According to the report, the Award Ceremony for Anticancer Warriors will be held in Modern Cancer Hospital every month to present anticancer warriors with gift and certificate. Meanwhile, it is hoped to get the cancer patients together to share experiences, show their perseverance and courage, and also spread love and positive energy to other cancer patients. ANG LIM HUAT, one of the anticancer warriors who got a 3.3cm lump on his neck in 2011, was diagnosed with nasopharyngeal cancer after taking examinations in Malaysia and Singapore. His son found that there was advanced anticancer technology in Modern Cancer Hospital Guangzhou. His son told him not to take cancer as death penalty, and suggested him to take treatment in Modern Cancer Hospital Guangzhou. In July 2011, after taking comprehensive treatment in Modern Cancer Hospital Guangzhou, his tumor almost disappeared. In 2015, he came back to Modern Cancer Hospital Guangzhou for a checkup; the result showed that there is no recurrence. PRASIT SUMONTA, one of the anticancer warriors, who got laryngeal cancer four years ago. The doctor told him that he only had three years. After introduced by a friend, he came to Modern Cancer Hospital Guangzhou. Before hospitalization, the size of his tumor was 20*18*10cm, and it was hard. After taking cryotherapy and other therapies, his tumor shrank obviously and his condition turned better. WILTON LILY, a workaholic who works over 8 hours every day. In March 2013, he found that there was a lymph node on his left side of neck, and the lymph node was as big as finger. Few months later, the lymph node enlarged obviously. Therefore, he went to Singapore for examination. Unfortunately, he was diagnosed with nasopharyngeal cancer. He took three sessions of chemotherapy, but none of them worked. He was so scared when the doctor told him that he only had two months. However, two months later, he still alive. In 2014, after introduced by a friend, he came to Modern Cancer Hospital for treatment. At first, he was doubt about Chinese medical technologies. However, he had no choice but to have a try. After taking cryotherapy, natural therapy and other comprehensive therapies, the lymph node on his neck shrank obviously and his condition turned better. Every anticancer warrior has their own extraordinary experience, the Malaysia media delegation was deeply touched by their courage and optimism.